If you want to get the most out of your Tampa Bay parking lot, reduce repair and maintenance expenses and please your customers, you need an asphalt sealcoating at least once every two to three years. Asphalt parking lots gradually break down just like every other surface. Consider the pounding your Tampa parking lot takes from vehicles, the sun’s ultraviolet rays, harsh rain, leaked oils and gasses and so on. As time progresses, these forces gradually damage the parking lot and threaten its functionality. You can do your part to preserve the integrity and beauty of your Tampa parking lot by hiring our experts for an asphalt sealcoating. Sealcoating a Tampa Bay parking lot every two to three years has the potential to double the space’s useful life. This means you will save hundreds or even thousands of dollars in repair and replacement costs in the short-term as well as the long-term. Sealer safeguards your parking lot’s asphalt like how paint and stain protect wood against the elements and other threats. Sealer also improves pavement flexibility to seal oils within the asphalt. An asphalt sealcoating done right will slow the pavement’s rate of deterioration, reduce repair costs and extend the pavement’s lifespan. Asphalt sealcoating improves the parking lot’s visual appeal, replaces segments of the surface that have eroded and combats oxidation caused by sun exposure. Asphalt sealcoating is especially important in Tampa Bay as we receive more than our fair share of sunlight. One of the few shortcomings of asphalt pavements is its somewhat poor resistance to the sun’s ultraviolet light and radiation. Sunlight causes your parking lot’s asphalt pavement to oxidize. The ultimate result of extensive oxidization is a reduction in the pavement’s plasticity. Oxidation also spurs the attraction of water molecules that speed up fatigue and cause thermal cracking as well as surface raveling. Asphalting sealcoating combats all of these issues. If your Tampa Bay parking lot is wearing down or if it has not been sealcoated in the past couple of years, it is time to act. Reach out to the best asphalt sealcoating team in all of Tampa. ACPLM has over half a century of industry experience. 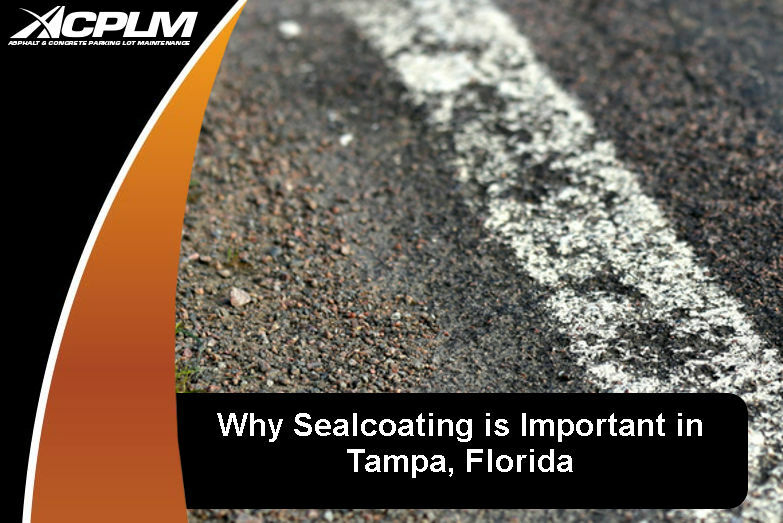 We know exactly how to sealcoat Tampa parking lots to preserve their integrity, combat natural forces and provide customers with a visually pleasing space. Reach out today by dialing 813-534-6455 for a no-cost parking lot evaluation and consultation.